This week, the Rotary Club of Sierra Vista welcomed back President-elect Jerry Regan from presidents-elect training seminar (PETS). Regan, a 37-year Rotarian will take over as president on July 1, 2018. President Nancy Fusco thanked Poppy Harber for coordinating the thesaurus deliveries to seventh grade classes within Sierra Vista. The last delivery of more than 400 thesauri was completed on February 7 at Joyce Clark Middle School by Poppy Harber, Frank Gonzalez, Joe & Peg Puett, and Nancy Fusco. 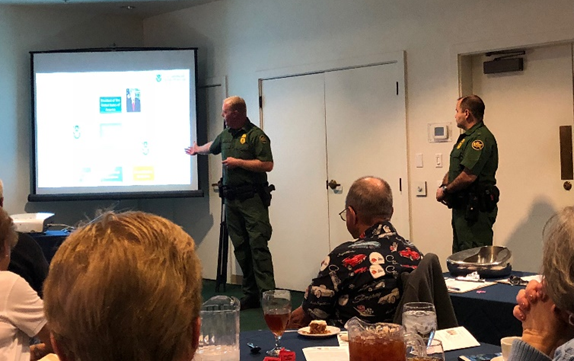 Tucson sector border patrol agents Stephanie Dixon, Jacob Stukenberg and David Jimarez provided an overview and answered questions in regards to their assigned detail along the Mexican border. The United States Border Patrol was founded on May 28, 1924 as an American federal law enforcement agency to detect and prevent illegal aliens, terrorists and terrorist weapons from entering the United States, and prevent illegal trafficking of contraband and people. Agent Stukenberg stated the Border Patrol is responsible for covering 6,000 miles of the U.S. border with 2,000 miles along Mexico and 4,000 miles bordering Canada. There are 20 sectors along the Southwest Border that encompasses 90,000 sq. miles for the Tucson sector to cover. There are eight stations and a substation that runs from the New Mexico state line to the Yuma county line. In 2017, the Tucson sector accounted for 45% of all marijuana seized and 13 percent of all arrests nationwide. Arrests have declined significantly from 616,000 arrests in 2000 to 38,657 arrests in 2017. Although the amount of contraband has increased by 65.4%, or from 240,000 lbs. to 397,000 lbs. seized. Agent Jimarez discussed the infrastructure deployment in downtown Nogales and also mentioned that upgraded detection technology allows for better day and night cameras with ground sweeping radar and that anything moving will be detected. They also have mobile technology for remote areas during the day and thermal cameras for unmanned area surveillance. The Border Patrol utilizes horse and ATV patrol to assist with patrolling ranch land and bike patrols for downtown areas. Air and marine operations are brought in from time to time to assist an agent on a ridge. Jimarez stated that K9 tools used at the checkpoints to find narcotics and concealed humans. The Tucson sector has 11 checkpoints and with the Douglas checkpoint still in the planning stages. The Border safety initiative includes 250 EMTs who are trained to admit IV’s and every agent is trained to be a first responder. A Border Patrol education initiative that is pre-sented in schools called "Operation Detour" teaches kids to stay away from smugglers. Like other first responder agencies, Border Patrol offers a Citizens Academy, to learn more, contact the Tucson Station’s Public Affairs Office at (520) 748-4773. Agents Dix-on, Stukenberg and Jimarez left one final note – if you see something say something and call 1-877-872-7435. Each agent was provided with a gift from Rotary President Fusco and thanked for their informative presentation.